Acheron, the brain child, of Vincent Crowley (a satanic reverend) and composer and Church of Satan notable Peter H. Gilmore was formed in 1998. The band courted controversy from the start with many run-ins with the press and public, the Christian establishment and even appearances on network television. These were due to the band's Satanic views. The band's debut, for instance, was nothing more than Satanic commandments put to background music. A release commended by none other than Anton LaVey. The antagonists in Acheron formed a cult called The Order Of The Evil Eye that has now ceased activity, but was source of controversy for several years. The band has experienced much coming and going over the years but the core of Crowley and Gilmore remained. Of note is the band's dispute with Lethal Records of Austria, which the band claimed, had produced shoddy work and never paid the group. Shortly after the dispute and the placing of a curse upon the label, Lethal Records was never heard from again. The band had gotten involved with Vampirism in those years. Elsewhere, a frustrated Vincent Crowley broke Acheron up in 1999 and relocated to Ohio. There he spent time on his new act, Wolfen Society. An album called The Apocalypse was shelved. Nonetheless, a limited EP called Xomaly was issued in late 2002 through Italy's Warlord Records. Acheron signed with Greece's Black Lotus Records and released a compilation of various cover versions in early 2003. The Acheron compilation was called Tribute To The Devil's Music and featured music by Black Sabbath, Judas Priest and others. Rebirth: Metamorphosing Into Godhood was issued at the end of 2003 through Black Lotus Records. Following a 2008 demo the band signed with Displeased Records. An announcement for an album called The Final Conflict: Last Days of God in February of 2009 through Displeased Records was made. Acheron signed with Ibex Moon Records for the US release of The Final Conflict: Last Days Of God, w hich was being issued through Displeased Records. Acheron next picked not one but two guitarists. Art Taylor had been unofficially with the band for a year as of the winter of 2010. Eric Stewart was a former member of Mangled Faith and Infernal Faith. The two were previously in a King Diamond cover band called Them. Former guitarist Maximus Otworth couldn’t continue in the band due to his living too far away. He was playing in the band The Eddington Limit. After many line-up changes and delayed plans Acheron threw in the towel in April of 2010. Acheron would perform the Rites Of The Black Mass shows for the rest of the year however. Acheron, which disbanded in May, was back in December. Singer Vincent Crowley, guitarist Max Otworth and drummer Kyle Severn had reformed. 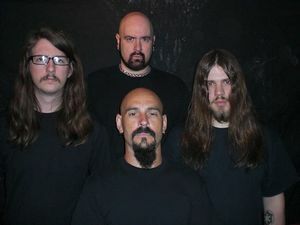 Guitarist Shaun Cothron (who was in Heavy Lies The Crown with Acheron’s other guitarist Max Otworth) joined the reformed Acheron in mid-2011. Listenable Records signed Acheron in late 2012. The band's next album, Kult Des Hasses ('Cult Of Hate'), was scheduled for release in the spring of 2013. Drummer Kyle Severn left Acerhon in May, 2014. He would not detail his decision insisting it is not for the masses.